A Senior Advocate of Nigeria (SAN) and human rights activist, Mr Femi Falana, has urged the President to stop allocating the nation’s oil blocks to a few individuals in the country. 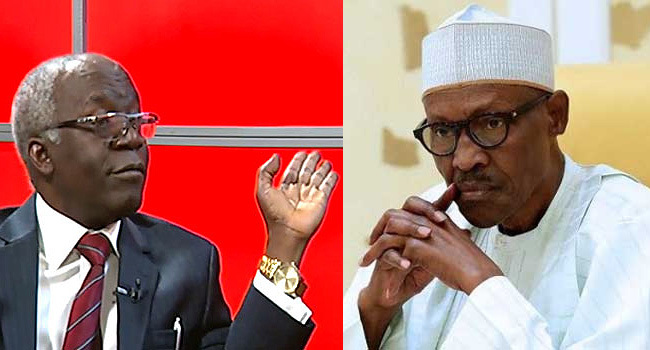 He made the appeal in a letter dated March 20, 2019, and addressed to President Muhammadu Buhari, a copy of which was obtained by Channels Television on Sunday. Falana noted that it was illegal and unconstitutional to allocate the nation’s oil blocks to a few individuals and corporate bodies, including multinational corporations. By doing so, he said the Federal Government has violated Section 16(2)(c) of the Constitution which prohibited the concentration of wealth in the hands of few individuals or group. The activist stressed further that the allocation of oil blocks to a few individuals and corporate bodies by the Federal Government constitutes a gross violation of the fundamental rights of the Nigerian people to freedom from discrimination. He added that the action equally violated the right to social, economic and cultural development guaranteed by the African Charter on Human and Peoples Rights (Ratification and Enforcement) Act. The SAN, therefore, asked President Buhari to restrict the allocation of oil blocks including marginal fields to the Federal Government and state governments. He vowed to challenge the constitutional validity of allocating the oil blocks and other natural resources to a few private individuals and corporate bodies if his request was not granted. Falana, however, commended the government’s decision to revoke a number of oil blocks and marginal fields allocated to a few individuals corporate bodies by former military and civilian regimes in the country.